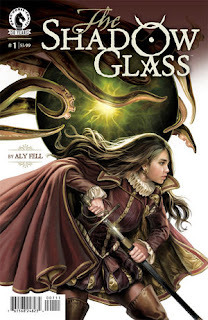 The Fellowship was fortunate enough to obtain a copy of THE SHADOW GLASS #1 from Dark Horse Comics. Aly Fell writes, draws and colors, and Nate Piekos letters. Rosalind is a teenage girl in Elizabethan England, and an unusually independent one. She’s had a happy childhood, with a father of some means and a teacher like Dr. Dee. On the day she learns that her father is dying, she also learns that he is not her father at all, and that her real father is a rogue, and that secrets have been kept from her. She runs to the good doctor for answers only to be faced with one more surprise. Young Rose is not your normal child in this time period, but she’s headstrong and curious enough to make for a great protagonist. There’s also more than a hint of supernatural in this story, of which the presence of Dr. Dee is only the beginning, and then there’s the mystery of her mother. And the art is truly wonderful, with an amazing sense of realism and a color palette straight out of an English garden. This first issue gives us the beginning of a well-constructed historical drama with the promise of something foreboding underneath. I think this one is going to be a winner. 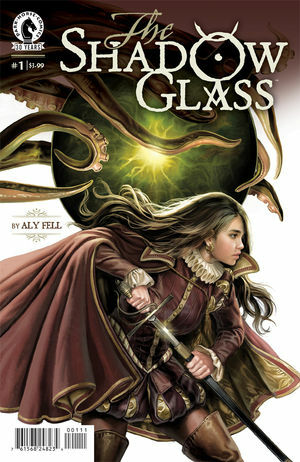 THE SHADOW GLASS #1 is available now at your FLCS or at darkhorse.com.